Obviously raising children isn't easy. And from time to time, we, as parents, need advice. Not the unsolicited kind, which is the worst, but actual solid parenting advice for those moments when we're freaking out and thinking how many therapy sessions our kids will need in the future. The internet is a good place to start, along with family and friends. But, sometimes there is just too much information out there. It's not always from reliable sources and 10 different websites can tell you how to approach the same issue 10 different ways-- talk about overwhelming! When that happens, it's always nice to get back to basics and hit the books. When I was pregnant I bought a bunch of parenting books and they have been so helpful. 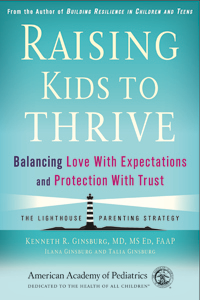 The American Academy of Pediatrics was kind enough to send me the brand new book by Dr. Kenneth R. Ginsburg called Raising Kids to Thrive. It's a great, all around parenting book. The main point Dr. Ginsburg highlights is balance in parenting. Love your children unconditionally, but still have expectations. Don't only show love when expectations are met. I know that might seem obvious, but the more I thought about it, the more I realized how easy unconditional love could become conditional love to a child. A nice little reminder. The book talks a lot about helicopter parents and how you shouldn't hover over your child's every move, but it's okay to watch them closely. This is something I know I struggle with, and the book has been very helpful in helping me understand why I shouldn't hover so much. Now it's up to me to put what I've learned to practice. Another section of the book I found very helpful was how to foster meaningful conversations and success with our children. Dr. Ginsburg lays out a few different suggestions to start conversations that inspire growth and not perfection, something I've always been an advocate of. I dog-eared that page for reference in the future. One last topic I want to feature is the importance of being a "tell-able" parent. A parent who is approachable and is able to have an honest relationship with their children. Dr. Ginsburg says that parents who listen well will have children who talk. That one little line in the book had such an impact on me, and I know will stick with me for years. Again, it's so simple, but so important. I often wonder how my relationship with Harry will be in the future, and I think if I continue to heed the advice in the book, we'll be just fine :). Overall, I really enjoyed reading Raising Kids to Thrive. I think it offers sound parenting advice, and reiterates a lot of things you might already do as a parent- but I found it comforting to know that a "parenting expert" and I are on the same wave length. The book's introduction invites parents of all age groups to read the book, and claim everyone can benefit from it. I agree, but I do feel most of the advice is more geared towards parenting kids five or six and up. At the end of every chapter there's a section called "More Thoughts From Teens," where various teenagers give their take on the topic. Those were some of my favorite parts of the book- as they're the ones who are directly affected by the book's parenting guidelines. Disclosure: This post is sponsored on behalf of rolemommy.com. All opinions are 100% my own. Rocksbox- Get a Free Month!